While exploring the jungle in the caldera of an extinct volcano, a boy and his grandfather discover the entrance to an alien outpost. A tripwire triggers a huge block of stone to roll back into a wall, revealing a spiral staircase that leads down into an underground vault. As they enter, theyre shocked to find an enormous dome lined with heavily embossed sheets of gold. More importantly, a star map is imbedded into a stunning, blue glass floor, its infrared tracery pointing the way to another world. Unfortunately, the chambers fusion reactor has reawakened after thousands of years and the room is about to self-destruct. In a burst of speed, they gather all the gold they can carry, shove it into their knapsacks and dive out of the entrance just as the great vault implodes. Years pass. Out of college, the teenager gets some unexpected news: his extravagantly wealthy grandfather has died, and the TV and Internet coverage reveals therell be an elaborate funeral for him in the Capitol Rotunda. Through a daringly clever ruse, the boy receives a secret package: three holographic discs and the keys to a starship. After an urgent message instructs him to assemble a crew, Auronas action-packed, stumbling voyage ensues. Reaching the planet, they find it completely surrounded by an electrically charged, golden shield. It takes some clever, innovative trickery with tiny surveillance robotoids to get them through, and a whole, different ecosystem surrounds them: they see that gold is everywhere, even permeating the atmosphere. Gargantuan trees can draw gold out of the ground, there are huge night-stalking insects with bioluminescent searchlights, saber toothed beasts can throw mind-stuns to paralyze their prey, and there are odd, fragile, gas-bag creatures floating around. Unfortunately, things have grown complicated: an alien stowaway has been hidden aboard in a sleep pod. It hadnt been plugged into the ships mainframe and the timing for its opening sequence is way off. After two suspenseful months of waiting, the crazed alien awakens in a rage, summoning more of his plasmorphic kind. They steal the starship and hold many of the crew as hostages, forcing them to dig all the gold the ship can carry. The alien boasts to return one day with a vast army to attack and plunder Aurona. As a product designer, artist and inventor, BB Prescott has always been fascinated with emerging technology. After his younger brother sparked him with the concept of a strange world with unique creatures and an amazing ecosystem, the fire was lit for Aurona. Encouraged by his new wife, he began the book in earnest on his honeymoon, drafting the first chapter on a flight to Amsterdam. After many years of writing and the story finally fleshed out, he completed the illustrations in three weeks. 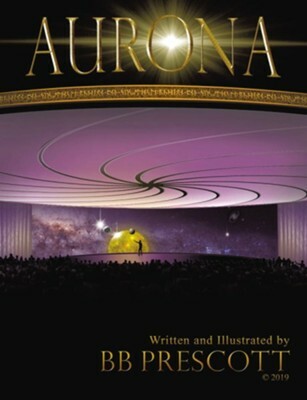 I'm the author/artist and I want to review Aurona - eBook.